I had a fairly productive Sunday. I finally organized my skincare and makeup (first time since we moved) and I ordered some new storage drawers for my products. I also re-organized my go-to-eyeshadow Z-Palette with the colors that I have been using the most, and voila’! Z-Palette post update with my ten most worn eye shadows was ready. Except for some Alima Pure eyeshadows that I like to use but come in individual jars (loose powder), I mostly use eyeshadows from Kjaer Weis, Red Apple Lipstick, and Sappho Cosmetics. They all come in metallic refill pans so that they can be stored in Z-Palettes (or swapped out of their original packaging). 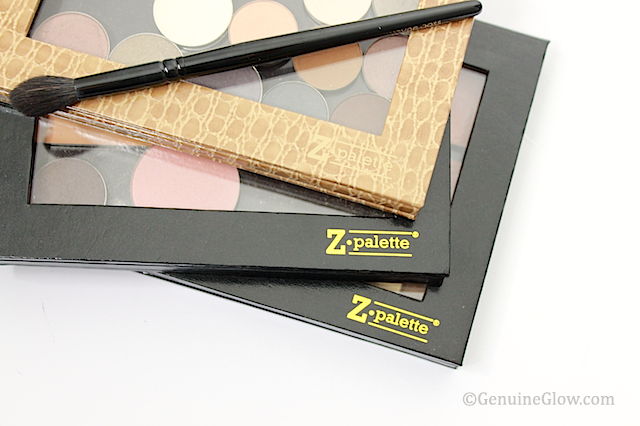 In case you are not familiar with Z-Palette, it is a magnetic palette that holds many products in one place as long as they have metal packaging. It is extremely convenient, and I highly recommend buying at least one where you can place eyeshadow refills, which are more affordable than compacts (unless you really love the look of glamorous packaging like the Kjaer Weis compacts, and I can’t blame you for that, it’s so gorgeous!). 1. Kjaer Weis Cloud Nine. An ivory color with a pearly finish that works great for highlighting brow bone, inner corner of the eye, and center of the lid or even as a base color all over the lid. It does not have any shimmer, but it is luminous and satin-y. Quick warning: this eyeshadow is almost always sold out in its refill pan. 2. Red Apple Lipstick Buttercream* The newest addition to my highlighting colors. It’s a beautiful cream shade with a subtle shimmer. I use this when I want the highlight to be more enhanced. 3. Kjaer Weis Charmed. This is a strategic shade: it covers the most important eyeshadow function, as it is the perfect contouring shade to define the crease. It’s a caramel beige color with a satin finish and no shimmer at all. This is what I use to define my crease when I go for a natural look, or as lid color if I plan to go for a more intense eye look. If you like neutral eye looks, and if you have a similar skin tone to mine, this is awesome and you will get a ton of use from it. 4. Kjaer Weis Magnetic* A golden brown color with a hint of shimmer. Not sparkly at all, but with just enough shimmer to give a soft glow. 5. Kjaer Weis Wisdom. A very unique taupe shade that has a bit of brown, gray, and purple in it and a soft shimmer. 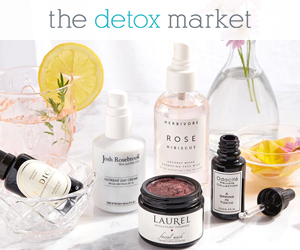 This is just gorgeous and truly unique. 6. Red Apple Lipstick Twinkle Taupe* A plum-y, brown with a satin finish and a very subtle shimmer that I think is universally flattering. 7. Afterglow Cosmetics Stencil A slightly green, slightly grey taupe shade with low, golden shimmer. Another very unique shade that is great for smokey eye looks. 8. Red Apple Lipstick Clean Slate* A medium gray color that veers toward purple and is totally matte. It may look chalky in photos but it actually blends like butter. 9. Kjaer Weis Divine. 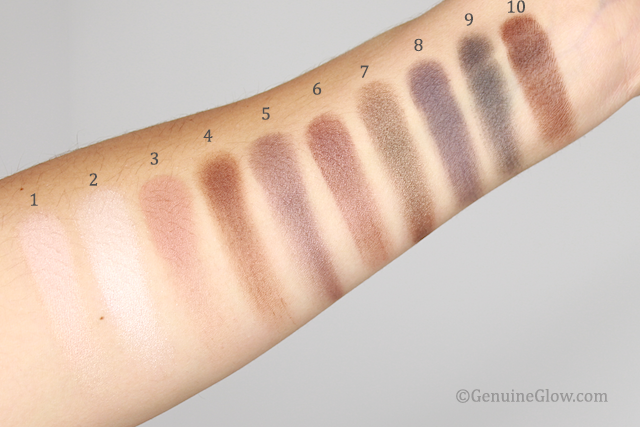 I have a whole post about this eyeshadow (you can read it here). This is a medium/dark, graphite grey with a satin finish. It’s perfect for a more intense smokey eye and it is particularly nice if you have brown/hazel eyes. 10. Sappho Cosmetics Jono (formerly Coastal) This is a rich, dark brown that is completely matte but has the loveliest, buttery formula. I use it in the outer corner to intensify any eye look or to line my eyes. 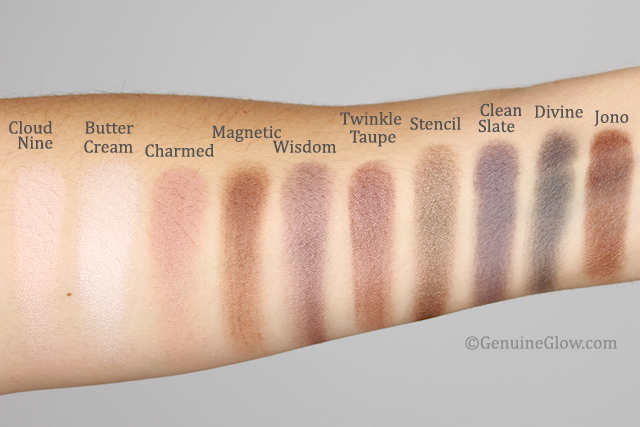 You can find a lovely selction of Z-Palette at Beautylish. What are your favorite eyeshadows? Is there any that you think I should pick up?